Hoboken plays against Williamsburg, Celtic sees Malatyaspor and it’s Sporting v. KidSuper this weekend in the Cosmopolitan Soccer League 2nd Division, proving that the action won’t stop until the end! Japan looking to leapfrog past opponents Beyond in the South! Beyond FC now sit just 2 points above their opponents, FC Japan, in the D2 Southern Division. Both teams want to end their season with a win to improve their play. Both of these D2 outfits have seen better days but they are still looking to improve towards the end of the season with a win at Randall’s Island. FC Japan are currently sit in 8th place with 2 wins, 2 ties and 10 losses. They have also allowed the 2nd most goals in the league with 54 and only scoring 19 goals on their end. They have nothing to lose with only an encounter with Stal Mielec NY left after this weekend’s action. With nothing but their eyes on solid victories, Japan top scorer Kenji Nakamura and company will look to play out of their skin. Their away opposition has only been slightly better on a record of 3 wins, a draw and 10 losses. Beyond FC have been struggling to find form since losing both matches in April and having their opposition forfeit last weekend. But Beyond is a team that loves its soccer regardless of their final position and will only hope to have a hell of a match against the Japanese. FC Japan will play Beyond FC at Randall’s Island Field #75 with kickoff starting at 8:00pm EST this Saturday, May 12th. On Sunday, it’s 2nd versus 9th in a must win game! Panathinakos USA has a tough face-off against the best defense in the league in Polonia Gwardia NY. Polonia Gwardia NY has enjoyed a successful league title push this season. With goals coming from their versatile players, the Poles showed why they deserve to be 2nd in the Southern Division with a thumping display against the aforementioned FC Japan 8-1 last weekend. 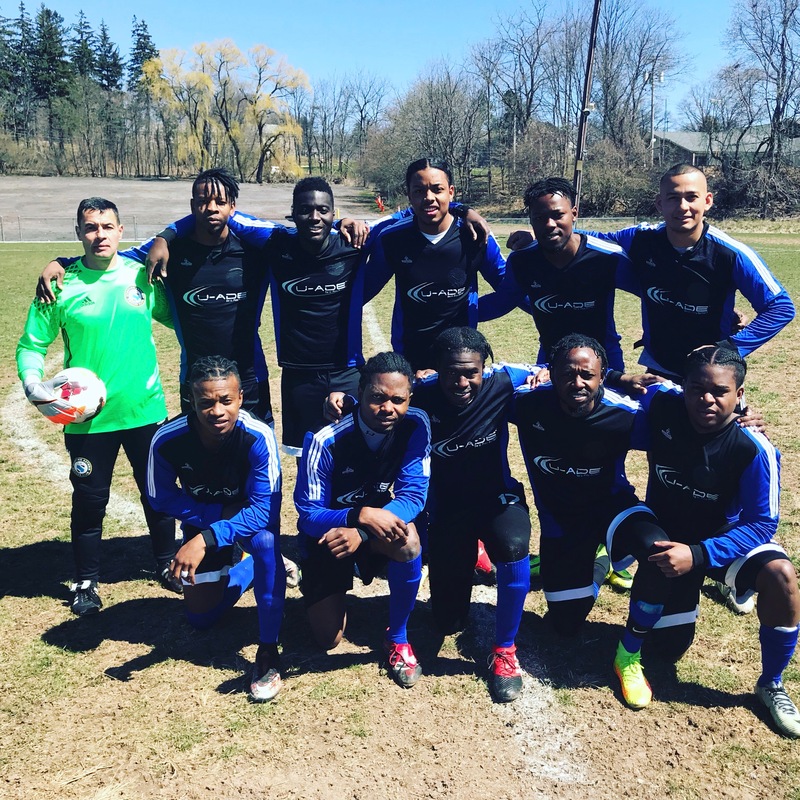 Now tied on points with league leaders Hoboken FC with 35 and a similar win-loss record, they hope to see the New Jerseyans drop points soon this weekend and see their first team win to take top spot in the standings. A Cosmo League staple for the last 55 years, they’re looking nowhere but up and towards promotion come the end of May. Panatha USA, unfortunately, can’t seem to keep a good run of form. Currently in 9th in the South, they are looking to play to keep themselves from recording a worst season than last season, where they ended 7th with 15. They have 7 points as of May 11th. Polonia Gwardia versus Panathinakos USA takes place at Randall’s Island Field #75. Kickoff is at 10:00am EST this Sunday, May 13th. Hard to predict this Sunday’s matchup against Williamsburg international and Hoboken FC. Both teams contain some of the league’s best gunslingers on the field. The Southern Division’s 4th place Williamsburg International FC are making the trip to New Jersey to play promotion favorites Hoboken FC 1912 in Week 19’s match lineup. Williamsburg are returning on the back of a 2-1 win over NY Ukrainians in the Jack Flamhaft Cup semi-final, with D2’s top goalscorer John Kaddo scoring 2 on the night for WIFC and could see off Hoboken FC this time. They look to Kaddo and skipper Mark Gallagher to score when needed as the two combine to have scored 34 of the team’s 54 goals this season - a whopping 62% percent of all their goals! 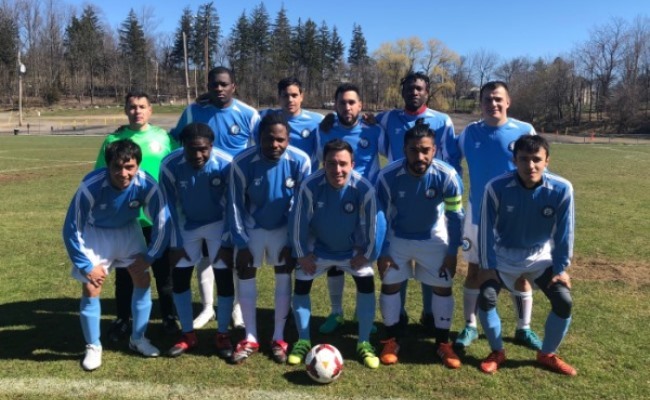 However, Hoboken FC 1912 have only conceded a single loss this season and it was back in April, where they suffered a surprise 3-1 defeat to Japan. Powered by players like Jeremy Witherspoon, Cory Chaplin and Thomas Hogue just to name a few within their starting 11 and bench, they are no team to take lightly as they also hold a great defensive record, only allowing 16 goals while scoring 67 goals in 14 matches! While Williamsburg International only has this single match encounter left against Hoboken, this will no doubt be a test for both participants. Hoboken FC will play Williamsburg at Laurel Hill Field #1 in Secaucus, NJ. Kickoff is at 12:00pm EST this Sunday, May 13th. The Rangers look to avenge Cup loss with a rematch in the league! Central Park Rangers’ Reds will face-off against Brishna again, but this time, it’s for 3 points up in the league table. Central Park must be a little sore from their recent Flamhaft Cup exit in the semi-final where Brishna’s Mohammad Mashriqi scored the only goal in that 1-0 loss. This time, they are facing on Randall’s Island with 3 points on the line in the North. Brishna will look to take that bit of fortune with them at Randall’s to face the Reds and hope for a win this time. Their first encounter of the season was back in October of 2017 at Flushing Meadow Park, a fiery matchup resulted in a 4-6 loss to Central Park. They look to add salt to the wound, following not only their Jack Flamhaft Cup semi-final win, but being already 4 points above their opposition going into the match. Central Park Rangers want to catch up to Brishna with these potential 3 points. They know how to break down Brishna and surely want another win on the table. Now that the Cup is out of reach, they have this upcoming game and a meeting with both Sporting Astoria and NYPD FC left in their season to get as many points as possible to end the season on the upper half of the season. Kickoff is at 5:30pm EST at Randall’s Island Field #83 this Sunday. Club Deportivo Iberia plays against NY Ukrainians this Sunday at Randall’s Island. Two of the most even placed teams this weekend will face off at Randall’s Island. Deportivo sit 5th in the South with Ukrainians with the former on 19 and the latter on 14. A win for both teams are ideal as their records are almost even. But with both teams not having much to play for as they aren’t very close to the top or close to the bottom spot either, they are just looking to play better than their opposition this time around. The kickoff for Club Deportivo Iberia against NY Ukrainians is at 2:00pm EST at Randall’s Island Field #75. KidSuper looking to outclass Sporting South Bronx! The last match of the night will be a phenomenal encounter between 2nd place KidSuper Samba AC and 8th place Sporting South Bronx. KidSuper Samba are looking to end the season positively with a win here against Sporting, who haven’t fared well against the players clad in black. As it stands, Super are 5 points below North leaders FC Spring Valley on 31. Losses for Spring Valley and wins for the team will be very beneficial for the possibility of promotion for KidSuper Samba. Besides supporting Astoria in the Saunders Cup, they can also look forward to Williamsburg’s surprise Flamhaft Cup run. For the team’s debut season in the D2 to end up at a Cup final, even Romero can tip his hat to them. 8:00pm EST is the scheduled kickoff for KidSuper Samba AC versus Sporting South Bronx at the Baker Athletic Complex in upper Manhattan this Sunday.